Diversion in place due to tree harvesting. Garden section diverted around due to repairs. All open and blue descent running sooooooo fast. Riding good with a few splashy bits. Should be dry up here as we are having some nice weather here in Wales. The black Raven trail is a real challenge with big climbs and super fun descents with massive jumps and huge berms and wall rides. The red Gorlech trail is fast becoming a classic on the Welsh trail centre network with its fast berm sections and awesome pump and jump style of trail. A bit different from the other trails in Wales, it offers berms, tabletops and long swooping descents ... there are easy options around the tricky stuff if you are building up your skills. The big climbs are rewarded with great views and incredible downhills that can only be described as a work of art. A trail you can ride over and over, it'll ride differently every time. The green and blue (an extension of the green) Derwen trail is a really good ride, it's a great introduction to riding at Brechfa and we love it! This route pumps and jumps through the lower levels of the forest keeping climbing to a minimum but also rewarding the efforts you do put in. A real 'fun for all' trail, it's worth riding what ever your skill level. Don't be surprised to find yourselves riding with everyone, from young families to experienced mountain bikers. Cwm Rhaedris a short but fantastic man made trail within a small block of Forestry Commission woodland. It consists of one 3.5km climb on mainly forest road with singletrack switchback climb at the top followed by a 4km predominantly downhill singletrack descent back to the car park - absolutely brilliant - guaranteed to put a smile on every mountain bikers face. A renowned local natural trail a short 20min drive from BikeBrechfa. 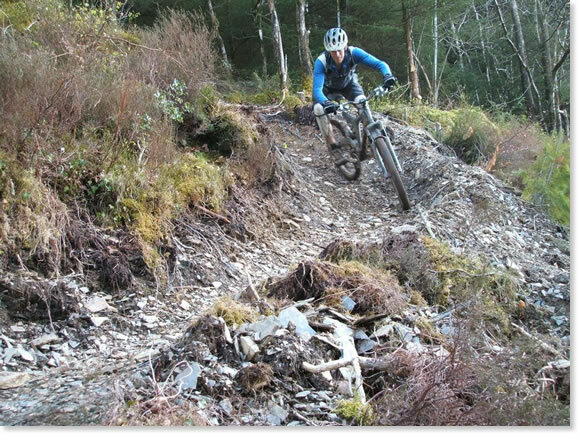 The trail comprises of steep shale climbs and legendary 4 mile natural singletrack descent. We're a short distance from the Brecon Beacons which contains the infamous Gap route and the Black Mountains killer loop to name just a few, follow this link for further information on the trails. Or let Bikebrechfa show you around for a fantastic tour of their favourite parts of this beautiful National Park. If you haven't ridden there by now then you must be living under a rock. Oh and while your down there pop into Skyline Cycles for parts and hire bikes. This is big mountain country - long climbs mixed in with great singletrack and classic rocky descents, Bikebrechfa can show you parts of Wales you never knew existed. Proper remote riding with no waymarkers to follow out here. Great remote mountain riding across moorland fells. Take you cross bike or 29er for maximum fun. This is a great route to mix in the Cwm Rhaeadr Forestry Commission trail. Swoopy man made singletrack mixed in with natural mountain tracks to give that wilderness riding experience. Fantastic. For more local information visit Summit Cycles in Aberystwyth.